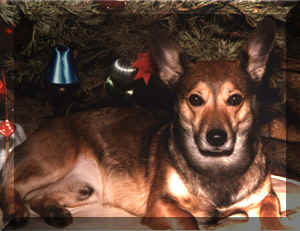 The reason I started looking for a Swedish Vallhund is that on May 4, 1994, I lost my pal, Snappy, who was 17yrs old...and I think, looked similar to the dogs I now know as Swedish Vallhunds. If not for Snappy, I'm not sure what dog I would have as a companion now. Snappy was bought at a small pet store who bought puppies from neighboring people. He was tiny...only 5weeks old...and 'came like a snap', hence, his name. He was a from a litter of one. The store owner couldn't tell me what breeds he was, he guessed terrier or spitz and shephard. He had harness markings and a facial mask and a similar build to Gaelen's. He was very strong for his 30lbs and fast and energetic. Back in 1978, his vet had said "if we were further ahead with genetics, I'd love to have a breed just like Snappy"; he didn't know of the Swedish Vallhund. Snappy's last few months had gotten very tough for him and myself. He dislocated a kneecap again (he had slipped on ice at age 8 and hurt himself...running TOO fast), had internal bleeding and much arthritis. Our home vet was often at my house working with Snappy but the real telltale sign was when Snappy's tail...a full, proud curve...didn't wave upright anymore...he really was doing poorly. So, I made the hard decision to not have him suffer anymore and the vet, Paul Turkel, came to my home. I had Snappy on the bed with me and was cuddling him as he was put down and released from pain. The vet and my friends who were with me were wonderful but my heart was aching so much for so long...and even now, I cry when writing this. I am including this page as a memorial to Snappy who led to my getting Gaelen. 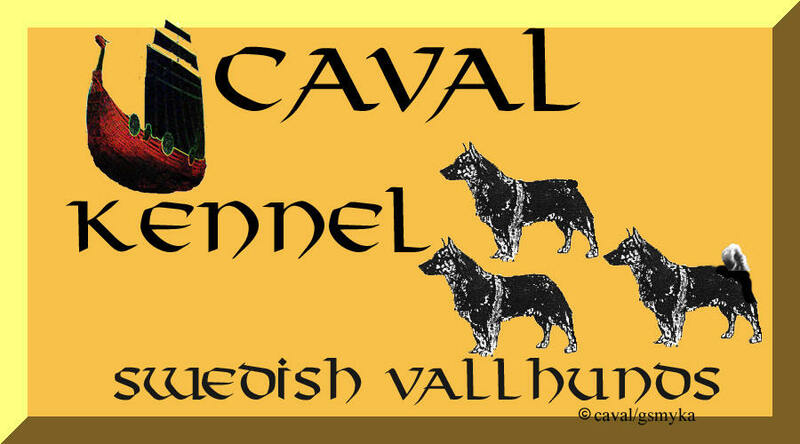 I saw the Swedish Vallhund in a dog book and searched for them for almost two years. I finally met Cheryl at the AKC show at COBO hall, Detroit, Michigan, five minutes before I left the show. I was resigned to not finding a Viking Dog and was going to get another breed. The rest is History. I also want to share with everyone a spot on the web where people talk about their beloved friends who are gone. About 6 months after Snappy's death, a friend gave me the poem, the "Rainbow Bridge". It's a tear-jerker but lovely. Please visit the spot when you can and pay a tribute to your past friends. A Light of my Life...now dimmed from my view but bright & vibrant in my heart and mind. Love lives on, my friend.